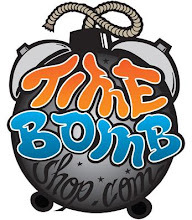 TIME BOMB SPOT: Where It's At Wednesday! 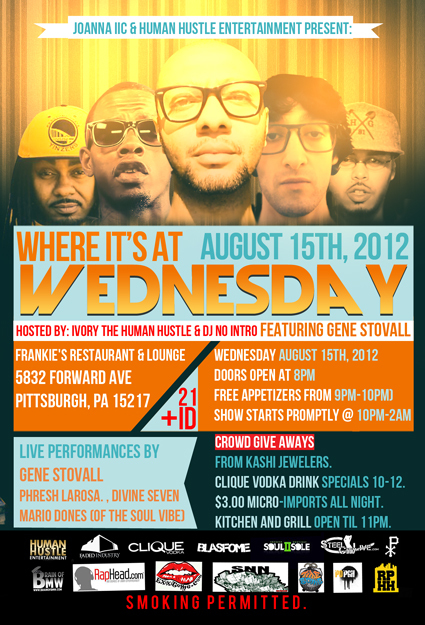 Gene Stovall, Mario Dones (of the Soul Vibe), Divine Seven, Yury, & Phresh Larosa. 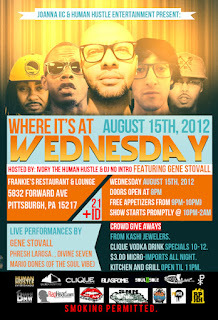 Joanna IIC & Human Hustle Entertainment bring you an all new Wednesday night music series, WHERE ITS AT WEDNESDAY'S. This bi-weekly music series caters to a more sophisticated crowd, while bringing you some of the most talented artists in hip hop, R&B, jazz, and more. Early bird specials on food, drink specials, all night! Frankie's Restaurant & Lounge in Squirrel Hill.